I came across this image from Conscious Reminder this morning not long after awakening and has played about in the back of my mind ever since. In my experience, change can often be quite a challenging journey for one to traverse. Take for instance my current journey "toward a more healthy me". You like how I put a positive spin on that? Originally, I typed "my current journey in weight loss", but isn't that exactly what Conscious Reminder is attempting to point out here? A journey "toward a more healthy me" focuses more on 'building the new', rather than 'fighting the old', wouldn't you say? There are some who might argue that it's all semantics. Over the years, though, I've become a strong believer that everything is energy and that, even, our thoughts and words hold energy of their own, which affect our surroundings our circumstances. 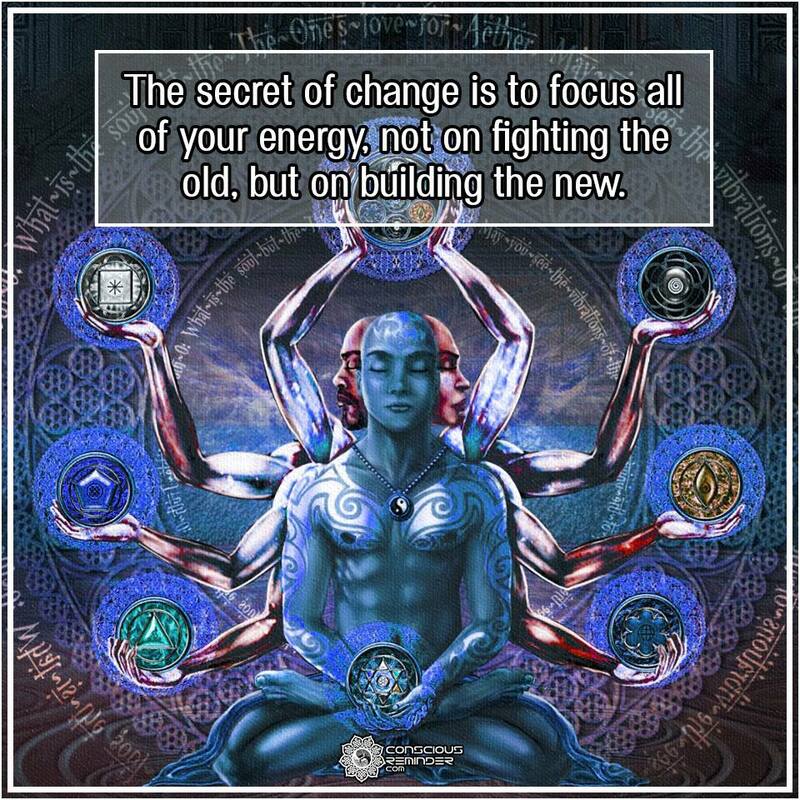 Fighting our current circumstances, the old, just denotes resistance, where focusing on that which we desire to build, the new, has more flow to it. What about your own life? Can you see a place where you might be fighting the old? How might you create better flow, less resistance? If even by making a small change in your perception of the situation? It's been 5 years now since we first moved to the Ozarks. It was a dream realized. A dream, which kept Dh and myself going through the seemingly long years which led up to his retirement from the Army. It took 3 years after arriving for us to make it to a piece of land upon which we could realize the homesteading part of our grand scheme of things. And so much more, it seemed. The dream? At least to me, didn't turn out quite the way I had imagined it would. Between necessary machinery constantly breaking down and a huge host of other factors, over time my spirit became weary with the fight. I was just... "done", and my way of being, I guess you could say, felt lackluster. I started searching for things that would renew my soul. It was about that time I started toying with the idea of taking a trip to "the beach". As a teen and young adult in San Diego, that was always where I would head when I felt down or just in need of a recharge. So, why not head back when in need of a jump-start? Only, after many long discussions with Dh, the idea of a vacation transitioned into plans for relocation. Fast-forward a month or two, and we're taking our first steps into the heart of this leap of faith. The original plan had extended a couple of years out. That was until my brother-in-law became involved. Now, it's an immediate future kind of thing with positions of employment involved! It's become a bright, beautiful, highly expanded dream from what it had been originally, which dreams tend to be when the Universe takes the reins, but it still requires a transition. From one, old, faded dream to the new. This morning, we said "goodbye" to our hens. One of which we raised from a pullet, and another we raised from a chick only a couple of days old. As I did so, the realization that I'm just not cut out to be a farmer was - once again - hammered home. I cried and am starting to cry even as I type this. During my time here, I've had quite a few indicators that this just isn't the life for me, but that was a huge reminder that the direction we're now going in the "right" direction for us. I'm excited to see what Spirit has in store for us, but am also reminding myself to be gentle with all of us through the transition.